Famotidine is a relatively safe medication that is also marketed under the brand name, Pepcid and is available in both prescription and over the counter forms. The most common side effects of famotidine medications like Pepcid are mild and may include dizziness, constipation, and diarrhea. Serious side effects are rare, but they may include signs of infection, depression, hallucinations, and others. Additionally, famotidine side effects can occur when the drug is taken by special populations or in combination with other medications or the treatment of other diseases. Information about these famotidine side effects is discussed at length. Famotidine is removed from the body by the kidneys and kidney function typically declines as a person ages. Therefore, elderly patients are the age group with the highest likelihood of experiencing side effects when taking this drug. This is especially true with side effects like dizziness and confusion. Caution should be taken when this drug is prescribed to elderly patients because of their added sensitivity to potential side effects, and if any side effects are experienced, elderly patients should consult with their primary care physician immediately. 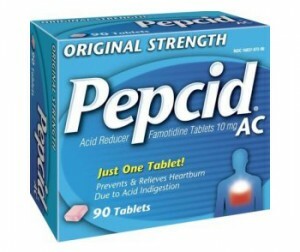 Famotidine and its brand name medication Pepcid have should significant success in the treatment and prevention of stomach and intestinal ulcers. Treatment using this medication can also relieve the pain and uncomfortable symptoms associated with excess stomach acid. In order for these products to be used effectively, it is important that patients discuss any other medication or health concerns they may be experiencing. Specific concern should be given to pregnant women and the elderly to ensure that when taking this medication the benefits outweigh any possible risks.